Would that we could listen in on the pitch meeting for Exorcist II: The Heretic. "It'll be like the first Exorcist for people who thought that was too nuanced and subtle." "Well, it sounds pretty bad, but what if we shot huge chunks of it from a demon locust's perspective?" "Perfect. And then maybe some unnecessary footage of Linda Blair tap-dancing." Was this all some colossal joke, or did the filmmakers actually expect to spider crawl their way to success? Exorcist II has found itself on countless "worst of" lists-Worst Sequel, Worst Horror Film, Worst Exorcism Movie Not Featuring Anthony Hopkins. It is indeed a failure on every level, the kind of bad movie that's too convoluted and boring to offer campy thrills. At least The Exorcist III had the decency to include cameos from Larry King, Fabio, and former surgeon general C. Everett Koop. (I guess the Harlem Globetrotters were otherwise occupied?) But as with all failures, it's interesting to look at what Exorcist II did wrong. One of the major problems is the overuse of Pazuzu-as a character, yes, but just as importantly, as a name. In writing, it's not so bad: try saying it out loud, though. There is no way Pazuzu, which sounds more like a misguided pet name than a satanic moniker, can hold up alongside legit demons like Beelzebub, Azazel, and Leviathan. And while Pazuzu is briefly mentioned in The Exorcist, he gets namedropped constantly in Exorcist II, always to unintentional laughter. "I am Pazuzu!" shouts a young African boy covered in locusts. Later, when Father Lamont travels to Africa to find the grown man, iconic actor Richard Burton is forced to bellow, "Pazuzu, prince of the evil spirits of the air, take me to Kokumo!" Exorcist II also does a weak job of exploring the interplay between science and faith, so well examined in the first film. That's because all of The Heretic's medical aspects are absurd. The Exorcist is scary long before Regan's faith becomes monstrous - you first cringe at the torturous tests she's subjected to. Here, Regan gets strapped into a "synchronizer" that allows people to visually share thoughts and memories. It's such a half-assed bit of science fiction that you have to wonder why it was included at all. Frankly, the demonic possession is a lot more believable. Linda Blair reprises her role as Regan, a career choice that likely continues to haunt her. (On the other hand, she parodied her character in 1990's Repossessed, also starring Exorcist II's Ned Beatty. Satire or not, it's a better follow-up to the original than The Heretic.) The script forces Blair to say lines so ridiculous it's hard to remember how good her performance in The Exorcist was. "I was possessed by a demon," Regan explains. "Oh, it's OK. He's gone!" In the film's climactic scene, she appears as both Regan and Pazuzu, shouting, "Pazuzu's Regan is the only Regan!" Somehow, everyone maintains a straight face. In fact, the separation of Regan and Pazuzu-as-Regan is another huge misstep here. Exorcist II cheats by drawing a clear distinction between Regan and the demon, further identified as the good locust and the bad locust. (Don't ask.) Part of the thrill of the original Exorcist is the conflation of monster and victim, whereas The Heretic presents glowy-eyed Regan as an entirely separate entity. Not to mention the fact that Linda Blair's age takes away much of the horror. Seeing a well-developed (albeit possessed) teenage girl try to mack on a priest is icky, but it's nowhere near as terrible as a 12-year-old violently masturbating with a crucifix. The final strike against Exorcist II is the way it tries to expand on the Pazuzu mythology, offering way more exposition than anyone asked for. Turns out the demon seeks out healers and otherwise blessed individuals - "Does great goodness draw evil upon itself?" In Africa, we meet Kokumo, a man who was possessed by Pazuzu as a child and continues to fight him off. 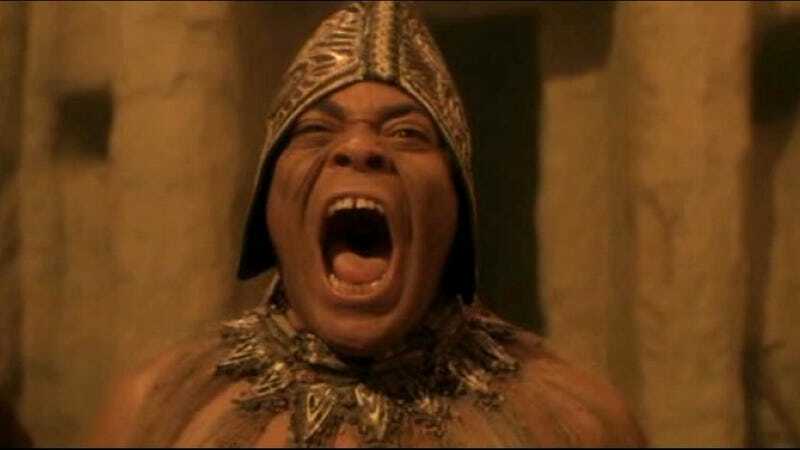 As an adult, he's played by James Earl Jones dressed, at one point, as a giant locust. Kokumo is now a scientist working to control Africa's locust epidemic, because the locust is the film's favorite metaphor - blatant but ultimately confounding. Of course, even the sum of all its mistakes shouldn't make Exorcist II: The Heretic as awful as it is - there is some rare bad movie magic at work here. It's a cautionary tale for sequels, for exorcism flicks, and for Linda Blair. But I don't regret watching the film, if only because it's part of Pop Punishment's mission statement. My goal isn't just to watch movies that are campy fun - sometimes I really do want to scrape the bottom of the barrel, which I think describes The Heretic well. Still, Father Lamont says it best. After sharing a particularly gruesome hallucination with Regan, he reflects, "It was horrible, utterly horrible. And fascinating."